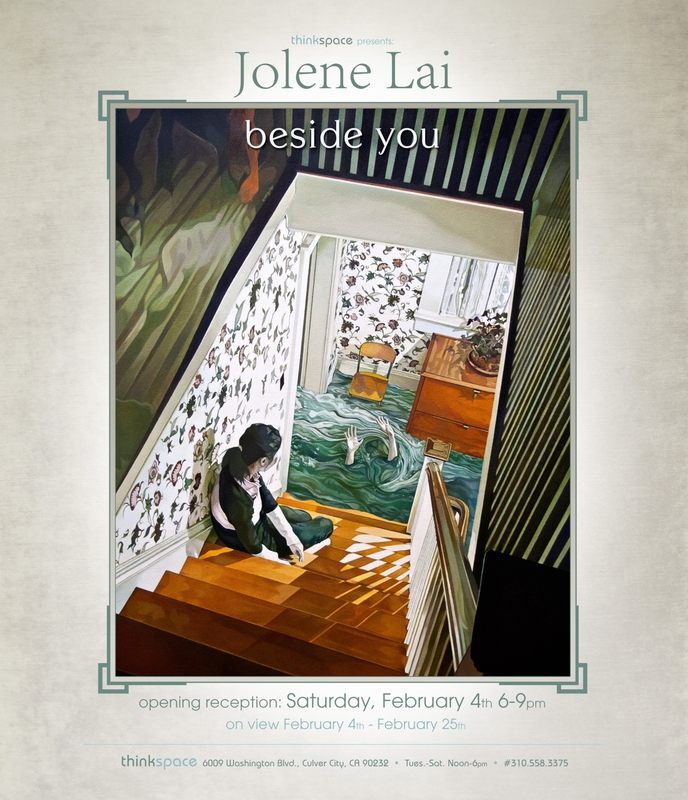 Thinkspace is proud to present Jolene Lai’s latest body of work ‘Beside You’ in our main room this Saturday, February 4th. 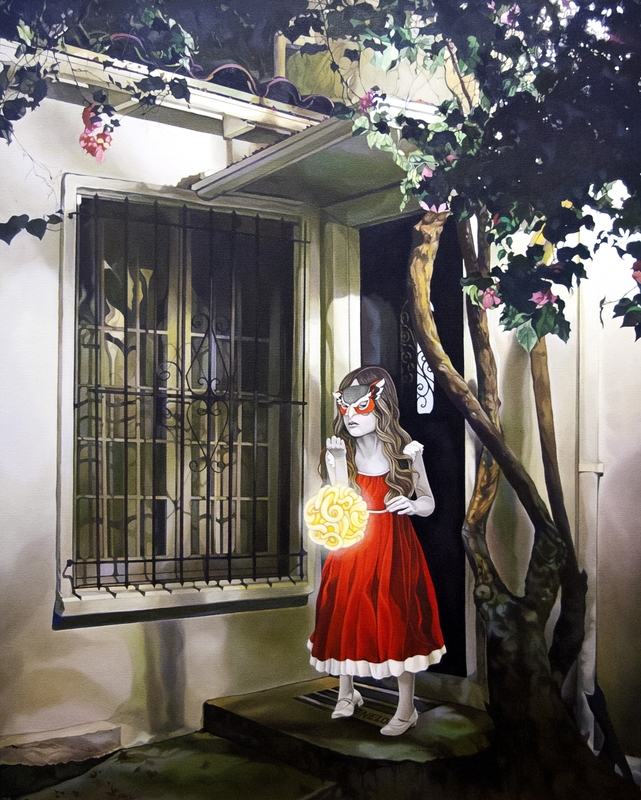 The Los Angeles-based Singapore-born artist reimagines archetypal stories drawn from myth, Chinese folklore, and fairytales to create surreal compositions with rich vibrant oils. 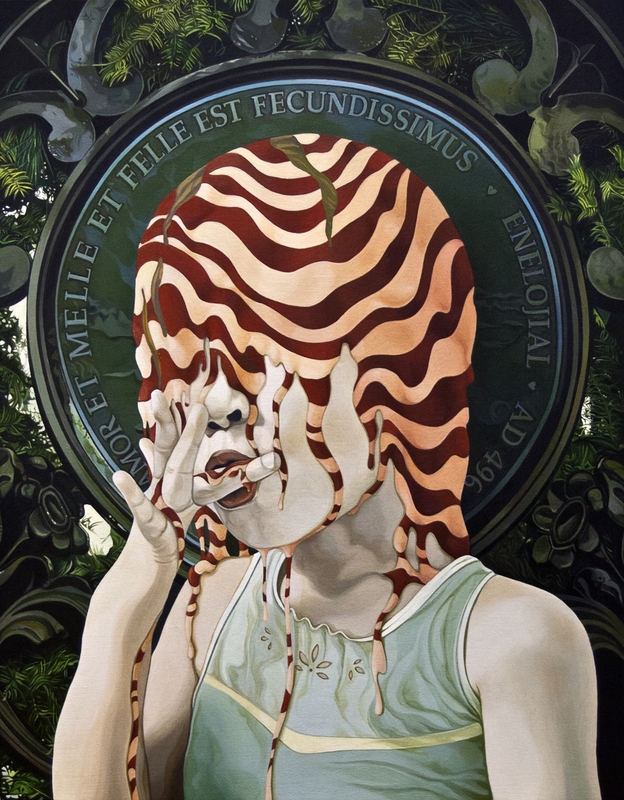 In anticipation of her upcoming exhibition with us, we have an exclusive interview with Jolene Lai to discuss her inspiration, the twisted nature of Asian horror films, a defining moment in her own adolescents and so much more. Join us at the opening of ‘Beside You’ Saturday, February 4th from 6 to 9 pm. SH: Can you elaborate on the inspiration for this latest body of work and what inspired you to explore this narrative? JL: Much like Lewis Carroll’s Alice’s Adventures in Wonderland, where the tale begins with Alice falling through the rabbit hole and into an idiosyncratic world that embraces both logic and contradiction, my new solo Beside You, attempts to draw viewers into a surrealistic world with familiar settings. 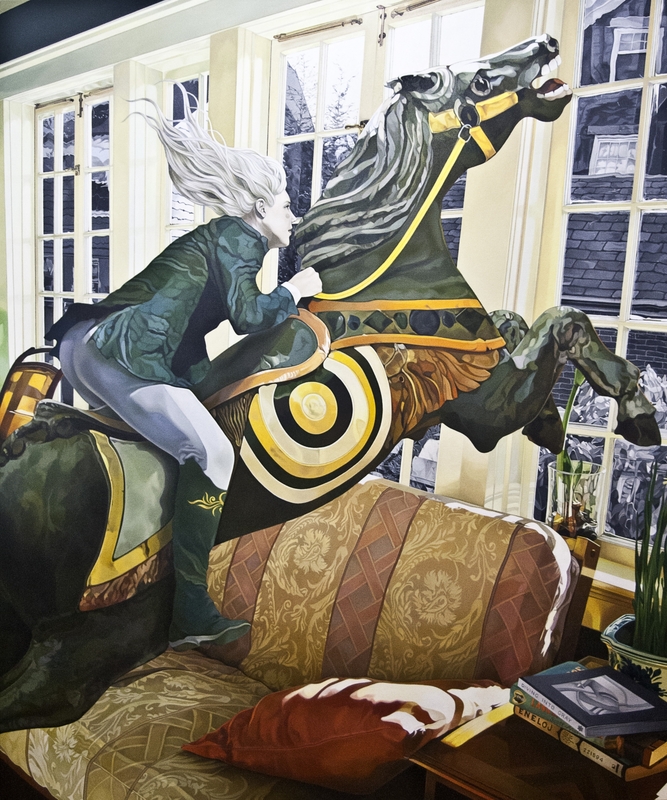 This new series of paintings explores re-enactments of stories from common experiences that are familiar to most. The relativity is reintroduced within strange and disorienting landscapes where bold characters integrate with ordinary spaces. In one painting, a back alley in broad daylight acts as the background. An impish little girl is running in the alley, while numerous giant tentacles are approaching from behind. The commonplace back alley now becomes a platform for an interesting dialogue about a girl’s escapade. What is previously banal becomes a fantastical location where a mischievous girl has conjured a strange playmate. In another, we see the interior of a house that is gushing with water with a pair of drowning hands reaching up from below the current. There is a girl sitting on the stairs, nonchalant and uncaring. I want to showcase Beside You by starting off with childhood naivety and playfulness, and take the viewer on a journey that gradually intensifies to bold but woeful characters dwelling in haunting spaces. The series of paintings eventually completes with the subject of maturity, where alienating and tense settings with uneventful, uncomfortable exchanges between characters. In each work, a different character is illustrated in a unique fantasy. Coming together as a whole, the various facets of each work allow for a more personal and unique interaction with the individual. In this aspect, Beside You is a mirror to one’s present, a re-visitation of the past and a portal to a future. SH: As the show is about adolescence, do you have a defining memory from when you were an adolescent you can share with us? JL: When I was ten, I had an episode with the next door children at the old apartment building where I grew up. I was out at the corridor watering the plants, when my neighbors’ children – three kids who were younger than me, began hurling obscenities at me for no apparent reason. Taken aback and annoyed, I ended up squirting them with my water spray bottle, which in all honesty, didn’t even get far enough to reach them. Minutes later, their angry mother knocked on our door and demanded my apology. My mum who learned about the ordeal, probably thought our neighbor’s unreasonable accusations and over the top tone was ridiculous and offensive, and so fought back harder. I think I was at a frenzy state of mind at that point of time. Caught between an extremely unpleasantly conversation which I had a part in causing, I eventually burst out in tears. My mum in trying to defend me, most likely saw my crying as a form of guilty admission, and reacted by snapping at me to stop my crying. I don’t think about that fateful afternoon too much, but I think it subconsciously resurfaces at times when I am a wreck and prompts me to be better at undertaking the hard knocks of life. I cry lesser these days and use a super-soaker when I water my plants. SH: It seems like you have a lot of fun when painting. What is your favorite part of creating a piece and what is the most difficult aspect of painting? JL: I keep a folder of jotted ideas, images of interesting perspectives of the places I crossed paths with, as well as researched materials pertaining to subject matters that have caught my attention. Each time I finish a project, I get to flip through this concise diary of thoughts. Some recorded tidbits I have forgotten over time, another fragments of information bring back familiarity. The browse is always interesting and refreshing, and reveals an insight to a moment of my life. I think the difficult aspect of painting is trying to get past that hump during the painting process. It is that period when the work is half complete and the work in progress on the canvas still looks like an underpainting, and that eagerness that was lifting you at the start is beginning to dissipate. You marvel at the notion of owning a clone of yourself so that you could hand over the monotony, and rejuvenate your soul with a new project. SH: Your work is very bold and colorful, and dances on the line of fanciful and dark. In a past interviews you’ve shared you were fascinated by Asian ghost stories, and bring a bit of that haunting quality into your work. Why do you think Asian cultures seem to have the most terrifying tales? JL: I think that is certainly more true if you are born and raised in a culture that is deeply rooted in superstitions. My upbringing was constituted of adults warning about bizarre taboos. I recall being told not to whistle at night or hang wind chimes by the window because it lures evil. And being reminded to never turn around if someone calls out your name at night during the Hungry Ghost festival (a tradition where the Chinese pay homage with food and incense to the spirits let out from the underworld during the month of July). The prevalent essence of most Asian horror dramatizes a lot on the uncommon nooks and crannies within common grounds. It shocks you when least expected and the content or characters told are hardly ever romanticized like what one might expect from Western horror tales. The late at night eerie tales we tell simply reflects the dead as it is – very much like you and I, just paler and quietly lurking in that darkest corner of your room. SH: There is a cinematic quality to your paintings. If they were made into a movie, who would be the director and what would be the storyline? JL: An in between of Hong Kong filmmaker Wong Kar Wai and American cartoonist Chris Ware. It is remarkable how these prominent figures who emphasize on ordinary aspects of the everyday, are able to tug at the heart strings of audiences and readers from all walks of life. The stories they portray are almost always relatable to any individual, despite the both of them coming from very contrasting cultural backgrounds. Creative minds who possess the ability to empower the insignificant command a lot of respect from me, and it is this unique quality that inspires my work. Briefly on the story line – A man who is not able to smile or laugh. He goes around documenting the happy expressions of strangers, and routinely practices in front of the mirror. He obsessively imitates every facial twitch and even tries to incorporate moving gestures to enhance his act. And no matter how hard he tries, the outcome was always awkward and peculiar. This was a short I worked on for fun some years back. I never found a befitting concluding plot, so I left it under my desk. SH: What draws you to oils versus other mediums? How has oil paints shaped you as an artist? JL: Are you drawn to smells? I am talking about the smell of a fresh stack of paper, the odor of sharpies or the sharp pungent fragrant of tree saps of certain botanic plants. The scent that oil paints emit attracts me like a moth flying towards the flame. No other medium does it quite like the same as oils do for me. It is an unhealthy obsession. I had experimented with watercolors, acrylic, pastel, graphite, etc. while in art school, and thought them to be interesting in their own unique ways. There are many techniques one can explore with each media, but it was oil paints that spiked my fancy. My first attempt at oils was one that was filled with curiosity and excitement all at once. The consistency and odor of oils was distinct in comparison to the other mediums I have tried. The flexibility of this forgiving media that stay true to its pigment before and after application was delightful to me, and it is through oils that my knowledge of other art materials and techniques continues to be broadened. SH: In a past interview you joked that you paint faster when tipsy, is this because it alleviates self-judgement? If so, do you have any advice for artists on pushing through the “awkward phase” of their work? JL: Sometimes a combination of painting and listening to music tempts me to drink. I have very weak tolerance for alcohol, so a few sips raises my blood pressure and unwinds my persnickety tendencies. I do however enjoy that brief moment of losing a tiny bit of control over my rigorous routine, but most times, you will catch me listening to documentaries or podcasts instead of music if you step into the studio. On the ‘awkward phase’ – Embrace the discomfort at all times. It is a crucial part and parcel of your work in progress that plays an important role in helping to motivate you to always try to construct a better remedy. SH: Best food in Singapore? Best food in Los Angeles? JL: I used to be a fanatic of crabs, so naturally the thing I had missed most when I moved to the US was my country’s famous chili crabs. With the main ingredient being fresh Sri Lanka crabs, it is an uncommon dish even in Asian restaurants here in Los Angeles. But all said, cravings for the simplistic foods back home that I used to take granted for keeps resonating. Like when I wake up in the morning and all I want is that luxurious spread of butter and kaya (jam made with caramel, eggs and coconuts milk) that is sandwiched between layers of toast. The kaya toast is of course only complete (in my opinion) when you pair it with Teh Peng (Iced milk tea that is concocted of black tea and condensed milk, and is never as sweet as the Thai iced tea). When the two co-joins, there is an instant explosion of bliss that melts in one’s mouth. Los Angeles is another upcoming mecca of great cuisine in the US. It is where varying cultural foods meet at an international plane. From Mexican to Ethiopian, Indian to Thai and American to Greek – the choices are endless. And while I love the limitless possibilities, I have to say I am a big fan of America’s burgers. The easiest, most cost efficient and taste worthy burgers where I come from was McDonald’s. I never understood the concept of what real good burgers were until I came here. I recently tried out Culver City’s Father’s Office burgers and really enjoyed it. Tasty juicy patties cushioned in between crispy light buns. The fries came out great as well at the right crisp, width, and length. They don’t serve ketchup though, so if you can’t do without, I suggest you bring your own. SH: Favorite thing to do in Singapore? Favorite thing to do in Los Angeles? SG: Taking short walks late at night and stealing glimpses into someone’s lit window during my strolls. LA: Taking short morning walks and listening to the cheery bird chirps. The early hustling and bustling vibrations always clear and refreshes my mind. SH: What was playing in the background while creating this latest body of work? JL: An array of Japanese 80’s music packed with nostalgia and whimsy. 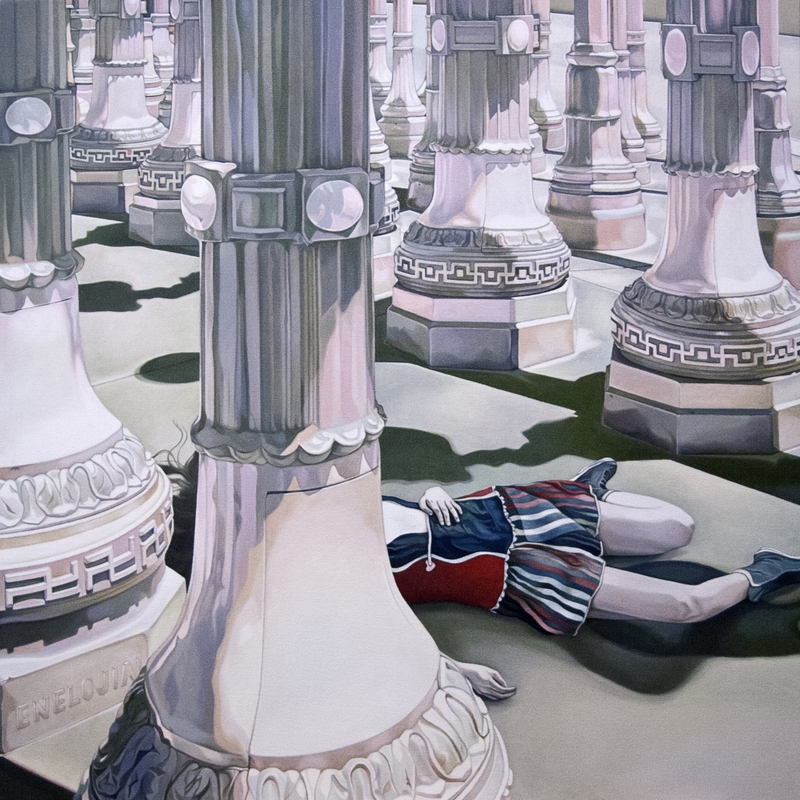 Comprises of artists like Mai Yamane, Junko Ohashi and Miharu Koshi. SH: You didn’t decide to pursue a fine art profession as a painter until you were 30, how do you think you benefited from choosing to switch gears at 30 versus making the decision to paint in your early 20s? JL: The me in my twenties was still exploring, unsettled and clueless. I wanted to dip my fingers in all the new colorful things that came along, and my restless temperament led me to never linger on an avenue for too long. The early brief encounter with different art-related assignments acted as a clear indication to myself that the creative industry was where I wanted to immerse. Trying out the various arts departments such as teaching, illustrating and designing, helped me to understand who I want to be, and what I hope to achieve and accomplish in life. So when it came to my thirties, the messy tumbleweeds that used to obstruct my path were lessened and the journey ahead so much brighter and promising.